OpenEars 2.5 and all plugins out now! | Comments Off on OpenEars 2.5 and all plugins out now! ¿Qué Hay De Nuevo? After a just-slightly-longer-than-expected incubation period (ahem), it is my pleasure to introduce OpenEars 2.5: Hear All The Languages. Well, perhaps not all of the languages. Many of the languages! I’ve developed a language-agnostic grapheme-to-phoneme algorithm which works from a file format fast enough for a phone, and although perfection remains elusive, it is from 5-15x more accurate for generating phonemes than a naive letter-based algorithm. As a result of this, OpenEars is now able to support speech recognition with English, Spanish, Mandarin Chinese, French, German, and Dutch. The new languages will now work with all of the speech recognition features of OpenEars, including dynamic language model generation and switching, grammar generation and switching, and of course hypothesis return. As a benefit of the flexibility of this format, today Politepix will also release 2.5 versions of every plugin. RapidEars, Rejecto and RuleORama are now compatible with the languages OpenEars is compatible with. 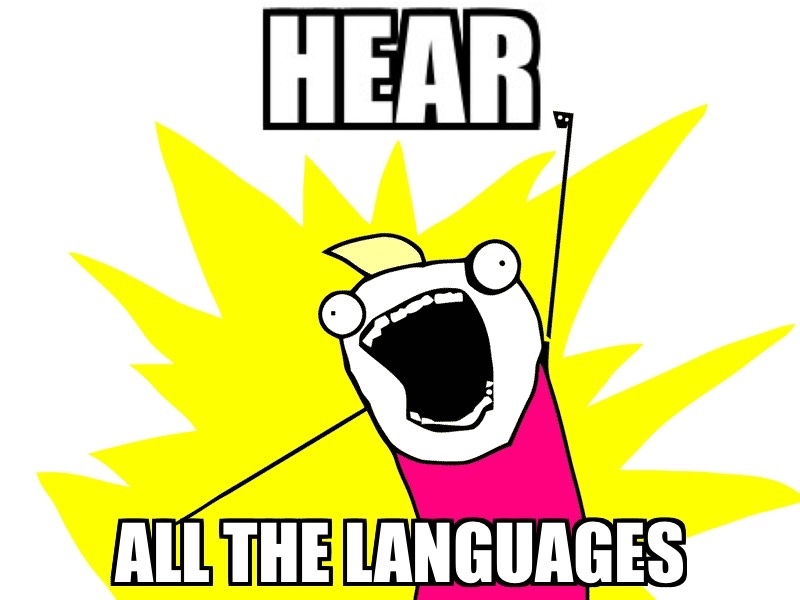 NeatSpeech 2.5 is a compatibility update, but won’t be adding TTS output for the new languages. SaveThatWave also has a compatibility update. By the way, if you are using another language’s Sphinx-compatible acoustic model and you want to make it compatible with OpenEars, you can get in touch to discuss options – it is a pretty flexible approach so I expect to be able to apply it to more languages. Speech recognition will vary significantly due to the speed and accuracy level of the acoustic model used, so support for non-English acoustic models is very much on a best-effort basis moving forward. Tut mir leid, Schatz! The next feature of the OpenEars Platform 2.5 is bitcode. OpenEars will now ship with embedded bitcode, and bitcode is now a configurable option for paid plugin framework purchases (subject to a handling fee). Plugin framework demos will also now have a non-recompilable bitcode segment so that they install easily, but the bitcode attached to the demos can’t be submitted to the App Store. Demos can’t be submitted to the App Store in any case, so this shouldn’t be an issue. Bitcode is also supported on a best-effort basis, meaning that no warranty is made for what it does when it is recompiled. This is not because I don’t care, but because a) no one knows the minutiae of how it will be recompiled, or b) what architectures it will be recompiled with, or c) what the strategic importance of bitcode is to Apple really, and it is a fair assumption that d) there will not be any communication about what is happening if it doesn’t work, so that is a process that, realistically, Politepix has no control over. What is the advantage of bitcode from the developer perspective? Hoe komt een ezel aan twee lange oren? This OpenEars Platform update also fixes all verified bugs to date, which is my very favorite kind of update. Other than the ones which add Chinese speech recognition, 哇! OpenEars 2.5 is free as always. The 2.5 paid plugin framework license upgrades are free if your purchase was made after August 17th, 2014. Upgrades for licenses purchased before August 17th, 2014 are 50% off. The bitcode handling fee is an extra fee for all upgrades if you want to add bitcode to your frameworks. The new Licensee site has rolled out (same URL as before), and on it you will find coupons for your upgrades in your download area, either for a free upgrade or a 50%-off upgrade for each of your licensed plugins. Quel délice! This is a big update with a lot of moving parts, so if you encounter any surprises or frustrations, no te preocupes, just visit the forums, let me know what’s up, and I will be happy to help. OpenEars 2.5 can be downloaded here and you can browse the compatible language acoustic models here. Make sure to check out the license for the language to be sure you’re able to use it with your project. I’m delighted to be able to bring the real potential of localization to offline speech recognition with OpenEars, and I can’t wait to see what you do with it. And to the developers who have been waiting for their language to be compatible, a heartfelt welcome/bienvenue/Willkommen/Welkom/Bienvenido/歡迎! OpenEars 1.2.3 and NeatSpeech 1.0! OpenEars 1.1, plugins, and RapidEars live recognition for iOS!